Attorney General Maura Healey, pictured on Jan. 31, 2017, during the announcement that her office would challenge President Trump’s executive order on immigration. Maura Healey has been an energetic, effective attorney general on both the state and federal level in her first term — and one good term deserves another. She has led an efficient office that’s always ready to do battle against institutional bullies on behalf of the powerless and the underprivileged, and which regularly intervenes on behalf of Massachusetts citizens in banking, business, and regulatory matters. On the national stage, meanwhile, she has led or joined numerous legal efforts to oppose ill-considered Trump administration policies. 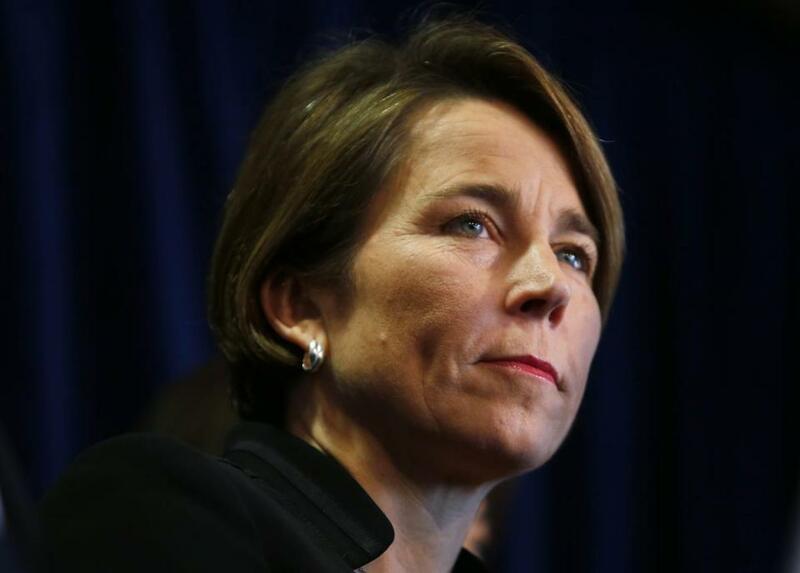 As the people’s lawyer, Healey has shown a proactive boldness, particularly on guns. A persistent voice for strengthening Massachusetts’ already tough firearm laws, she cracked down on copycat assault weapons designed to sidestep the state ban — and won an important legal battle after gun shops sued to stop her action. Her aggressive action in regard to utilities, insurers, lenders, landlords, and dubious business practices has resulted in hundreds of millions in savings or money returned or rebated to taxpayers, workers, and ratepayers. Stories about her success on that front have become so regular as to be almost routine. On the national stage, she has led or been part of some 30 efforts targeting Trump administration actions, about one-third of which have led to important (though sometimes temporary) victories. Just this week, a legal effort she quarterbacked resulted in a federal judge ordering Secretary of Education Betsy DeVos to implement protections she had delayed for student borrowers victimized by the predatory practices of for-profit schools. Another Healey-led effort helped persuade the Federal Energy Regulatory Commission to reject, for now, an administration plan to prop up struggling coal and nuclear plants. Her office led amicus efforts in opposition to the administration’s ban on transgender enlistees; after several court rulings against the ban, the military is once again accepting transgender individuals into their ranks. She also joined the successful effort to prevent deportation of the Dreamers, some 800,000 undocumented immigrants who were brought to the United States as children. Similarly, her office was part of the effort that won a preliminary injunction against the public release of plans to print 3D guns. One fair criticism of Healey is that she has been too cozy with the Teamsters union, which endorsed her in 2014; certainly she showed little interest in taking them to task for their bully-boy tactics with a nonunion film crew, preferring to leave that to other prosecutors. That said, she has demonstrated a willingness to prosecute disgraceful behavior by members of other powerful organizations. Her office has obtained indictments of several State Police officers who put in for thousands of dollars in overtime they didn’t work. She has also taken action against an array of police and corrections officers, MBTA employees, state workers, and local officials on various theft or fraud charges. A charismatic politician who knows her own mind, Healey has a bright political future ahead of her. Still, rather than trying to scramble up the ladder by running for governor this year, she wisely decided to seek reelection to her current post. Her Republican opponent, James “Jay” McMahon, who lost a son to the opioid epidemic, speaks forcefully of his commitment to expanding treatment and pursuing drug companies. However, the conservative defense attorney is running mostly as a Second Amendment champion who regularly gives voice to National Rifle Association platitudes. He even opposed the state action to ban bump stocks. He would be a poor fit for Massachusetts attorney general. Healey has been a very good one. The Globe strongly endorses her for reelection.